This is Part Four of a four-part series on our 2016 Tesla Model S. In Part One, I covered why we chose the Model S, the cost of the car, and a bit about Tesla the company. In Part Two, I listed some of the things I love about the car. In Part Three, I listed more of the things I love, plus those things I hate. In today’s Part Four, I’ll discuss what it’s like living with an electric car, cover a somewhat long road trip I took last fall, and offer a few thoughts on the future of auto electrification. Finally, tomorrow’s Part Five will provide an unexpected ending (of sorts) to the series. With that said, for the last two-plus years, we have used the Tesla as much as possible: With electric costs much lower than gas costs, and the car’s maintenance needs being less than our other cars, it just makes sense. Our total mileage over the last 30 months is over 31,000 miles, and that’s with just one road trip of any length. Obviously, a savings of $353 makes for a nearly-infinite payback on the purchase of the Model S. Our car maintenance was probably also lower, but still, if you’re buying an electric car based on the gas and maintenance savings, you’re either doing it wrong, or you’re driving hundreds of thousands of miles a year! For us, the fact that the car was electric was basically a bonus—we bought it because it offered a chance to try something new that seemingly met all of my diverse requirements for a vehicle. As I work at home, I don’t have a commute. However, I’m the main “taxi driver,” shuffling the kids to and from school and various events. On a typical day, I’ll put anywhere 20 to 50 miles on the car (which is comparable to a reasonably-sized commute), with much more on weekends as we do the usual running around. The Tesla is not our only car, so we didn’t have to rely on it for everything—but we do use it a lot, to the tune of about 12,000 miles a year. 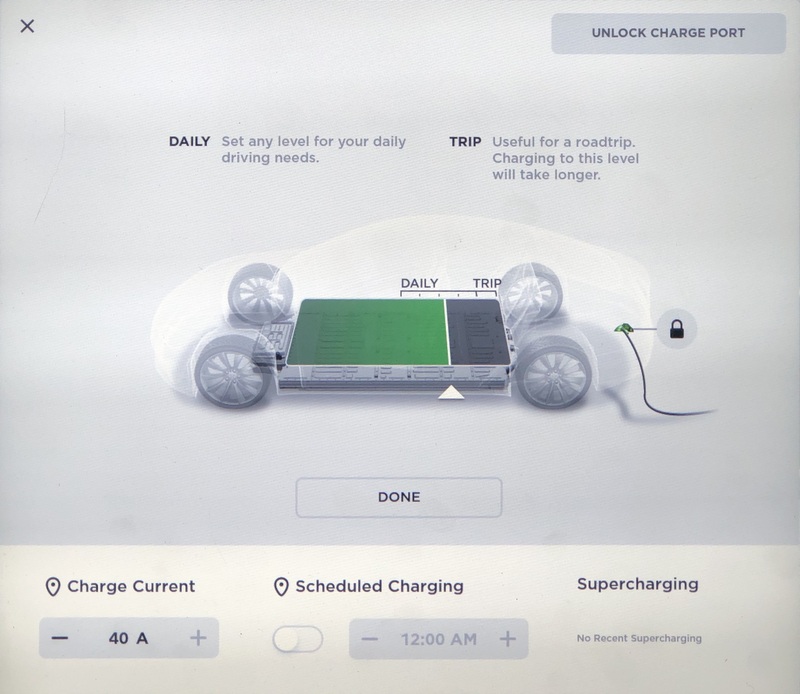 Note that each Tesla model has a different maximum recharge rate, due to different onboard chargers—the Model 3 has the highest possible rate, then the Model S, then the Model X. There’s a table about halfway down Tesla’s Wall Connector page that shows each model and its charging rate at various power levels. At the cheapest end of the spectrum, I can connect my Tesla to an ordinary wall outlet (120 volts / 15 amps) to recharge. This will recharge the car at something between two and three miles per plugged-in hour. At 2.5 miles per plugged-in hour, it would take nearly five days to fully charge my battery. Clearly this is an “emergency situation only” charging solution—or it could work if your daily driving is under 30 miles or so, as you could then recharge in 12 hours. The next step up in cost is to use an existing clothes dryer outlet (240 volt / 30 amp), which will only require a $45 NEMA 14-30 adapter. These outlets will recharge my Model S at about 17 miles per plugged-in hour, or roughly 17 hours total from empty to full. If you own an electric car, you really should have a NEMA 14-30 adapter—you could then perhaps charge at friend’s homes (with their permission, of course). The limiting factor here is distance from the dryer outlet: Unless it’s near/in the garage, you’re probably out of luck unless you have a really long charging cable. At the top end for home charging is a dedicated 240 volt / 50 amp circuit, which is what we had installed in our home. The cost for this will vary greatly, depending on how far away from the panel you want the plug, and if there’s any required panel work to support the circuit. In our case, we wanted the plug on the other side of the garage, and our panel had to be rewired all copper lines, so it cost us about $1,800. Without the panel work and if the outlet had been closer to the panel, it would’ve been about $350. This setup, though, can charge the car at roughly 30 miles per plugged-in hour, or just under 10 hours from empty to full. For a given day’s driving, then, the car is usually recharged within an hour or two. Note that I am not charging the battery completely full: Doing so on a repetitive basis is bad for battery life. And the reality is that you don’t need to fully charge the battery, unless you’re driving to the full range limit every day (which is highly doubtful). Still, this brings up an interesting point: The range figures you see for electric cars are values you’ll never use in the real world. My car’s theoretical range is 280 miles (it was listed as 293 miles when brand new, but it’s dropped a bit over time). As noted, I’m not supposed to charge to that level on a daily basis—I set the limit to just over 200 miles. In addition, weather affects battery life: Batteries don’t like it much when it’s very cold (and in some cars, very warm). Tesla used to have a Range per Charge calculator on their web site that let you input speed and temperature to see the impact on range. They took it offline at some point, but someone recreated the calculator using Angular. As you can see, Tesla’s batteries are more cold-averse than they are heat-averse: Dropping from 20C to 0C decreases the 90D’s range by about 9.5%, but going from 20C to 40C only drops it by 5.4%. I definitely notice that the battery drains faster when it’s cold outside than when it’s temperate. The good news is that even a drop from 20C to -10C only results in roughly 20% less range. Other elecric (and hybrid) cars may react differently to temperature extremes—we had a Hybrid Camry for a while, and its cold-weather battery performance was absolutely terrible. If I do take a trip and fully charge the battery, I’m still not going to plan on using all 280 miles of range—that’d be like planning a trip in a regular car to arrive with a completely empty tank at each gas stop. 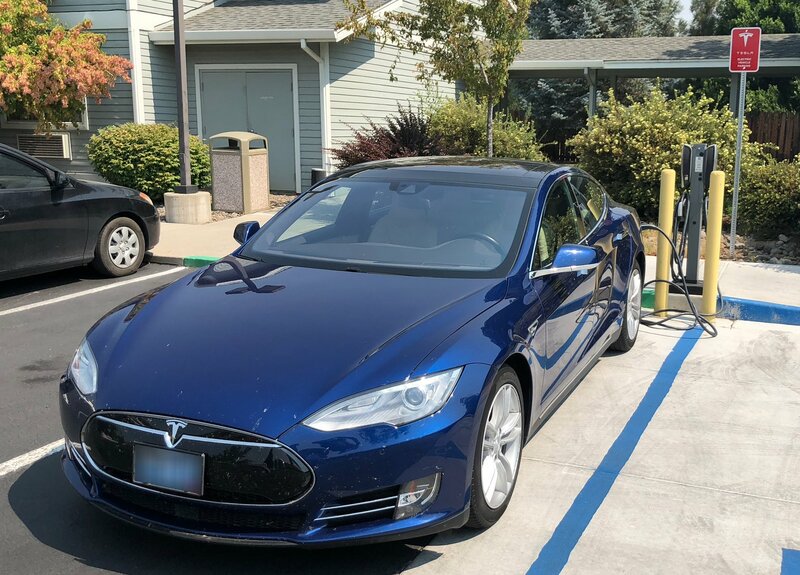 Even if I wanted to do this, I couldn’t, because charging stations aren’t everywhere: I need to plan around where the Supercharger (and non-Supercharger) charging stations are, and not around my car’s range. In addition to temperature, wind and elevation changes can affect range, so you want to have a safety buffer. So yes, while I have 280 potential miles of range, the furthest I’ve ever personally driven on one charge is about 260 miles (and yes, that left me more than just a bit nervous towards the end!). Overall, living with an electric car has been somewhat of a revelation. I love the ease of use: no warmup time, no cool down time, no real maintenance requirements, and the car’s systems make driving it both fun and relaxing. The Supercharger network makes real-world use possible (as you’ll read about below), and is a key strategic advantage for Tesla (at least for a while). As you can see, this is a mostly backroads path. There were a couple reasons for this, mainly that I wanted a scenic, not Interstate, drive. However, there were also some massive wildfires burning in California that were closing down the interstate in places, so this seemed like the better plan. Coming home, I drove north in Nevada, then cut over to Reno on Interstate 80, then headed home by the same route as shown on the above map from Reno northwards. This was much less scenic and fewer miles, and saved 90 minutes or so in total trip time. Of the entire trip, there was only one leg that was really “interesting” from a charge perspective: Klamath Falls to Reno is 254 miles, which is—in theory—within my 280 mile max range. However, this is a very mountainous route, and I was pretty sure I’d be running on partial electrons if I tried to stretch it to Reno. 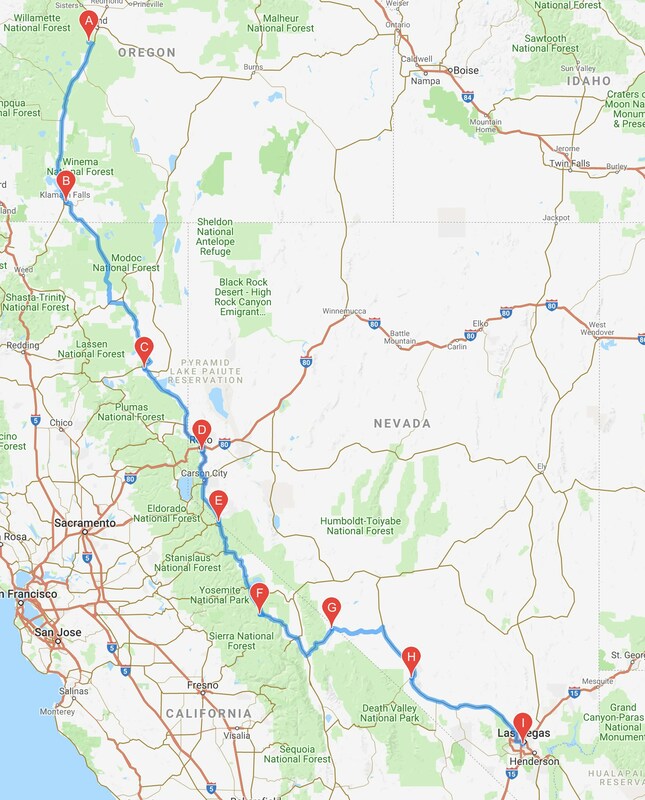 But as of now, there are no Superchargers between the two cities—just a Level Two charger—20 to 25 miles of range per plugged in hour—in Susanville, California. (Susanville is supposed to get a Supercharger in 2019, which will really help things out.) Due to the slow charger, I knew I’d be spending quite a bit of time in Susanville…as you’ll soon see. Klamath Falls, Reno and Topaz Lake all have Superchargers, whereas Susanville has only that Level Two charger. The impact of this slow charger is immediately obvious in the table: I spent nearly as much time charging in Susanville (2.60 hours) as I did driving there (2.73 hours). And that time really impacted the bottom line—I spent 37% of my first day’s drive charging. Compare that to day two, which was only 40 miles shorter than day one, yet took nearly four hours less total time (and only 17% of the time was spent charging). You can also see the difference in my average mph over the total time—it was only 40mph for the first day, versus 54mph for day two. Day one was all Superchargers, and as such, charging time was only 18% of the day. (Average speeds were down due to some massive traffic slowdowns into Reno.) Day two again shows the impact of Susanville—I again spent over two hours at the charging station—and given that it’s only 88 miles from Reno to Susanville, this dropped my average mph based on total time for that leg to just over 27mph! That little red sign reads “Tesla electric vehicle parking,” and it’s meant to keep the charging station clear for Teslas. However (click the image to see the full version) the sign’s position makes it look like the reserved spots are the one my car is in, and the one to the right (which is a handicapped space). In reality, the other space is to the left of my car (they’re the green-curb spaces). When I arrived at the charging station, there was a Tesla in one stall, and a non-electric car in the other. At that point, I was stuck: I couldn’t safely continue to Klamath Falls, but I couldn’t charge until one of the two vehicles moved. I waited in my car for about 10 minutes, and was just about to go to the front desk with the non-Tesla’s license plate (to see if they’d notify the owner to move it) when he came out and left. Whew. Had he not moved his car, and if the office weren’t willing to contact the owner, I would’ve been stuck waiting for one of the two cars to leave. Between the slow charging times and the ease with which no chargers could be available, Susanville really needs that Supercharger. Little did I know my adventures for the day were not yet over. I was making this drive in the heart of wildfire season, so I’d checked the fire map the day I left Las Vegas, and everything was clear on my route. But while I was driving that day, lightning started a fire in the hills between Susanville and Klamath Falls—about 80 miles north of Susanville. As it turns out, it was a pretty big fire. Yea, it was pretty thick. There also was minimal to no cell coverage in this area, so I couldn’t even find out what was going on. Things got really dicey when I saw a sign that read “Road closed – two miles ahead.” At this point, I was over 80 miles from Susanville; if the road were really closed, my only recourse would be to drive back to Susanville and get a hotel room for the night—there are no charging stations (and really, almost no gas stations) between Susanville and Klamath Falls. Needless to say, I was quite happy to get past that without having to do an 80 mile backtrack and spend another night on the road. Overall, I was happy with the results of the road trip—even with the slow Susanville charger. In a way, that slow charger really shows the advantages of Tesla’s Supercharger network. I can’t imagine trying the trip I took in a Chevrolet Bolt or other electric car without a high-speed charging infrastructure. With the Bolt’s 240 mile range, you could safely drive perhaps 200 miles, and you’d then need to recharge. If you can find a public DC Fast Charger (and you bought the fast charge option for the Bolt), you could add about 216 miles of range in 30 minutes…but as of today, there are no DC Fast Chargers anywhere between Klamath Falls and Reno (a distance greater than the Bolt can travel). There’s no doubt that traveling long distances by electric vehicle isn’t as easy as it is in a gas powered car. Trip planning is more complicated, and days will be longer, given the need to recharge. But at least with Tesla and the Supercharger network, there are lots of chargers to be found, and they recharge relatively quickly. If you’re in a hurry, though, electric is probably not the right choice. The fact that it’s even possible, though, still amazes me. Prior to buying our Tesla, we’d never owned a pure electric vehicle; we’ve had hybrids (and presently have a Hybrid RAV4), and liked the improved gas mileage with only slight compromises (typically less trunk space) they offer. An electric car, though, is a completely different machine than a hybrid, and in all ways but one, it’s a better machine. That one, of course, is range limitations on long trips. But as Tesla has shown—and Volkswagen/Porsche/etc have promised—it’s possible to build a network of charging stations that makes long trips possible, if still not quite as simple as when done in a gas-powered car. Personally, after three years’ experience, we’re bullish on the future of electric vehicles. They require barely any maintenance, they’re quiet in operation, brakes will last a really long time, electricity is cheaper than gas (and can be cleaner to produce), nothing other than wiper blades and some air filters really need regular replacement, and they can be a hoot to drive. I think there will always be a place for internal combustion engines, but for most people, an electric car will easily meet their transportation needs. Who knows what the future really holds, though. For us, we’re very happy with our Tesla, and don’t regret our decision to make the purchase nearly three years ago. Subscribe and you'll receive an email when a new post appears here (no spam! ).